For almost 30 years the battle between the forces of humanity and the Convenant, an aggressive collection of alien species, has raged across the galaxy. Countless moments of bravery and danger have made heroes on both sides of the war, but above all others stand the Spartan super-soldiers and their leader: the Master Chief, John-117. Spartan (Active Camouflage): Captured Covenant light-bending technology enables Spartans to become almost invisible. Most of the abilities are enabled by a small device attached to the user's lower back. When not in use these devices also project a hologram that displays an icon of the ability, allowing for quick recognition when switching abilities. 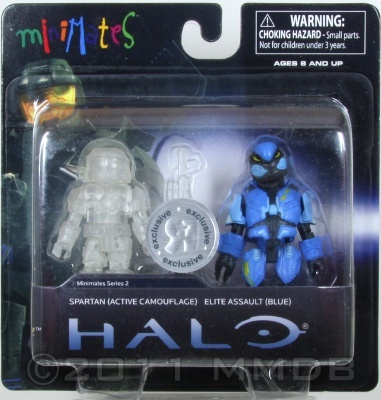 Elite Assault (Blue): The Assault harness is an armor set designed for the Elite race of the Covenant. It features reinforced composites and offers more protection to aid in absorbing the shock from kinetic energy bursts.